We native Filipinos have been so brainwashed into believing that we are essentially corrupt, i.e. with a "culture of corruption" in our blood/veins, figuratively speaking. Maybe to a degree we have become so after witnessing for generations the corrupt practices of those in power (in government, military and business), top to petty bottom; foreign, then native. As may be said: "the values of those above cascade down to those below" or something to that effect. We may not know exactly when our high corruption index began, but it appears that during the early American colonial period, our new foreign masters - the Americans- were no better than the defeated Spaniards (i.e. hated friars); as demonstrated in the following case of the so-called "Friar Land Scandal." Dean C. Worcester (the zoologist) while they occupied positions of power during the colonization of our homeland: the former as Commissioner of Commerce & Police/Vice-Governor then Governor-General (1904-1913); the latter as Secretary of the Interior . 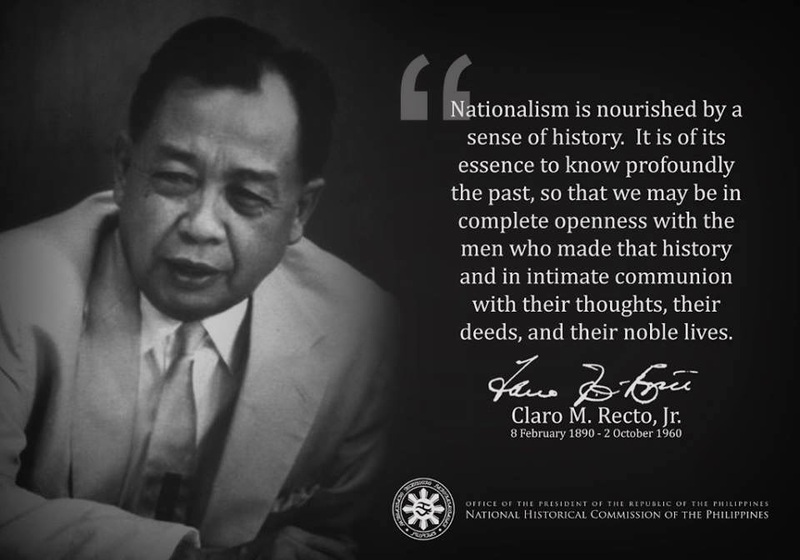 Both men spoke and wrote history books on the Philippines that had vigorously declared the incapacity of us native Filipinos for self-government and had opposed early granting of independence. Some fellow Filipinos with Americanized minds have quoted these guys in their defense of American colonialism and American Exceptionalism . I suspect there were many other instances of corruption and exploitation for economic/financial gains by individual Americans and American corporations of the time and, therefore, such were possible reasons for imposing the Parity Rights as a prerequisite to the granting of Philippine (mainly political) independence in 1946. Anyway, I hope you will read and pass along this lengthy piece. I extracted it verbatim as I find it extremely important to transmit such hidden truths (omitted in our official and popular American-Philippine history books,etc.). At the session of 1910-1911, there was referred to the Committee on Insular Affairs of the House of representatives the following resolution of the House, under which an extensive examination of its subject was made: "Whereas it has publicly been charged that sales and leases of public lands have been made in the Philippines in violation of the law: Now therefore, be it "Resolved, That the House Committee on Insular Affairs be, and it is hereby, empowered and directed to make a complete and thorough investigation of the interior department of the Philippines government touching the administration of Philippine lands and all matters of fact and law pertaining thereto, whether the same are to be had in the United States, the Philippine islands or elsewhere, to report to the House during this congress all the evidence taken and their findings and recommendations thereon:..."
The investigation demonstrated the existence of very serious abuses in connection with the public lands in that were the like to have taken place within the limits of the United states proper, those concerned in them would speedily be removed from office by impeachment or otherwise. The situation developed was of such a character as to call for the immediate interposition of Congress. It seems useful in the beginning to make clear the statutes which control the public and so-called friar lands and the proper interpretation of such statutes, to the end that it may be discovered whether the facts subsequently to be narrated exhibit a departure from the letter and spirit of the law. The organic act controlling the Philippine Islands and creating civil government in the islands was passed on July 1, 1902. Section 12 placed the "property and rights" which may have been acquired in the Philippine Islands with certain exceptions, under the control of the Government of the Islands, to be administered for the benefit of the inhabitants thereof. Section 13 provided for the classifications of such lands according to their character. Section 15 authorized the Government of the Philippine Islands to provide for the granting or sale and conveyance to actual occupants and settlers, as well as to other citizens of said Islands, such portions of the public domain as it may deem wise, not exceeding sixteen (16) hectares to any one person; and for the sale and conveyance of not more than 1,024 hectares to any corporation or association of persons; all conditioned upon actual and continued occupancy, improvement and cultivation for not less than 5 years, during which time the land is inalienable and may not be encumbered. Sections 63, 64, and 65 deal with the Friar Lands Section 63 authorizing the Government of the Philippine Islands to acquire and convey title to real and personal property, and Section 64 particularly providing for the purchase of the Friar lands and issuance of bonds therefor. Section 65 provides that the Friar lands so acquired shall constitute part, and portion "of the public property of the Government of the Philippine Islands" just as we have noticed that Section 12 was intended to classify the lands acquired under the treaty of peace with Spain as "public property" placed under the control of the Government of the Islands, although acquired by the United States. The Friar lands, Congress continues to say, in Section 65, "May be held, sold, and conveyed, or leased temporarily for a period not exceeding 3 years after their acquisition by said Government on such terms and conditions as it may prescribe, subject ot the limitations and conditions provided for in this act." The legislation was as thoroughly well safeguarded as legislation could well be. The particular provisions stated by Congress as necessarily applicable to the circumstances to be created by the purchase of Friar lands being made, in all other respects the Philippine Government was to be bound by the conditions and limitations applicable to public property. So manifest was the intention of Congress in this respect that the limitations and conditions were not only applied by Congress to the lands after their acquisition when they would be disposed of, but were even made a condition precedent to the acquisition, as is manifest in Section 63, relating to the Friar lands, authorizing the Philippine Government to "acquire, receive, hold, maintain and convey title to real and personal property," "subject to the limitations and conditions prescribed by the act." With this view firmly in our minds, let us see the particulars in which the Philippine Commission has, as we believe, radically departed from the act of Congress from which its authority, and sole authority, has been derived. In providing for the disposition of the Friar lands, the Philippine Government, in its act above recited, has, to begin with, in No.1120, inserted a recital to the effect that the Friar lands were not "public lands," in the sense in which those words were used in its own public land act, No. 926. This recital was absolutely incorrect, however convenient or proper it might have been to provide proper agencies for meeting the requirements of Sections 63, 64 and 65, with reference to their leasing and selling, and the creation of a sinking fund. we find that this act No. 1120 was amended by Acts Nos. 1847 and 1933, authorizing the leasing of the lands for a term not exceeding 3 years, which was contemplated by the act of Congress, and the sale of such lands as the Director of Public lands should think for the best interests of the Government, but in neither No.1847 or No.1933 is any reference made to the amount of land to be included in the sale, so that, as we have stated, a casual reader, or even a careful one, might believe that the sales contemplated, and the only sales permitted, were those which were provided for by the Congressional Act with relation to the public property of the Philippine islands, of which the Friar lands were, when purchased, by the express language of the congressional act, made a part; that is to say, sales in quantities not exceeding 16 hectares to a private individual, or 1,024 hectares to a corporation and then only under the conditions as to agricultural cultivation provided for by Congress. But as we have seen, and shall see in detail, the Commission has given an interpretation permitting, should the opportunity arise, the sale of an entire unoccupied Friar lands to a single individual. But the Philippine commission has gone still further in its disregard, absolute in character, of the limitations and conditions affecting the disposal of the lands originally public lands as well as those after acquired and becoming, by thje terms of the acts of congress, public property. The very specific language of Section 15 of the Act of July 1, 1902, permits public domain to be granted or sold and conveyed to "actual occupants and settlers and other citizens of said islands" except as to number and mineral lands. It is manifest from the careful reading of this provision that it was the intention of congress in the first place that only actual occupants and settlers who were citizens of said Islands, and other persons , such citizens, could acquire from the Government any portion of the public domain. It was not open to a foreigner or to an American citizen to acquire title from the Government to a foot of land other than timber or mineral. Such lands were reserved absolutely for the citizens of the Philippine Islands. And who were such citizens? Section 4 of the Act states: "that all inhabitants of the Philippine Islands continuing to reside thereon who were Spanish subjects on the 11th day of April, 1899, and then resided in said islands, and their children , born subsequent thereto, shall be deemed and held to be citizens of the Philippine islands and as such entitled to the protection of the United States, except such as shall have elected to preserve their allegiance to the crown of Spain, etc." This view is absolutely prohibitive upon the acquirement of public lands by any persons, even citizens of the United states, who do not come within the classification that we have just given, and receives additional force from the fact that section 21 of the Act of July 1, 1902, provides "..That all valuable mineral deposits in public lands in the Philippine Islands, both surveyed and unsurveyed, are hereby declared to be free and open to exploration, occupation, and purchase, and the land in which they are found to occupation and purchase, by citizens of the United States or of the Islands." The proof of citizenship required of such individuals or corporations is fixed by Section 35. In dealing with coal lands, Section 53 permits their entry by any person "who is a citizen of the United States or of the Philippine islands, or who has acquired the rights of a native of said Islands under and by virtue of the Treaty of paris or any association of persons severally qualified as above." Forest lands were, by Section 18, left subject to the regulations theretofore established by the Government of the Islands. We have, therefore, absolute and impassable line-drawn between agricultural lands of the Philippines on the one hand and the mineral and timber lands upon the other: the first only obtainable from the Philippine Government by virtue of the applicant being a citizen of the Islands and the others obtainable by American citizens and Filipinos, or pursuant to the prior acts of the Philippine Government or later Amendments thereto. Both by express limitation upon the nationality of the takers of agricultural lands and by the contrast made by congress between such nationality and the nationality of those taking other classes of lands, was it made clear that Congress intended the agricultural wealth of the Philippines to be limited to the natives of the Philippines, and only obtainable by them upon compliance with conditions as to occupation and cultivation. In this wise Congress guarded against alien ownership and against the acquiring and holding of public lands for speculative purposes. What were then the powers of the Philippine Government with reference to the leasing of public lands? Section 13 allows the Government of the Philippine islands to make rules and regulations for the lease, sale or other disposition of the public lands other than timber or mineral lands. Section 15 provides, as we have stated, for granting --meaning by way of homestead-- and for selling to actual occupants and settlers. Section 63 provides for the acquirement of the Friar lands subject to the limitations and conditions prescribed in the Act, and conveyance of the title. Section 65 provides for the temporary leasing, for a period not exceeding three years, of the Friar lands. With this understanding, which we hope we have made clear, of the Congressional Act and Intent, let us state briefly, following the matter up by specific reference to proof, the various violations of law of which the Philippine commission has been guilty. In defiance of the Congressional direction that public lands should be granted or sold and conveyed only to citizens of the Islands, this not including Americans, the Philippine Government has passed laws authorizing sale, and has actually executed deeds of conveyance in fee simple of portions of public lands, not mineral or timber, to Americans and as well as we can understand the testimony, to other persons foreign to the islands. We instance particularly the public sale of public lands in the town of Baguio to Governor W. Cameron Forbes, Secretary of the Interior Dean C. Worcester , Assistant Director of Public Lands J.R.Wilson, and a great number of other Americans employed and not employed under the Philippine Government. The Philippine Government has in like violation of law sold to American corporations there several tracts of public land of abut twenty-five hundred acres each. The Philippine Government has in like violation of law sold or contracted to sell fifty-five thousand acres of Friar lands to an American representing other Americans and an American corporation, and has contracted to sell to other Americans about one hundred thousand acres of other Friar lands. In violation of the Congressional enactment, no power to do so being granted by Congress, the Philippine Government passed laws permitting the leasing of large amounts of public land to Americans, and under such act on tract of nearly one thousand hectares has been leased at a nominal rental fixed by the Commissioner, to the nephew of Secretary Worcester., for a possible term of fifty years, creating an estate in him differing little in value from an estate in fee simple, which, as an American, he could not have taken under the Act of congress, and sixty times as great as even a Filipino would have been permitted to purchase from the Government of the Islands. The Philippine Government leased for a period of three years, with right to purchase, which has been partially executed, over four thousand acres, to the man, who, as Executive Secretary, was practically one of its own numbers, and in order to give sanction to the contemplated sale, passed an act under which he expects to acquire title to the entire tract. It is well understood and does not need the citation of authority to establish, that when a public body is authorized to make rules and regulations, even when having the effect of law and being made, such rules and regulations can not, under any circumstances, enlarge or diminish the powers originally conferred upon the officers or body making them. To give any other interpretation to this language would be to authorize the minor authority to legislate in contravention of the wish of the superior, whereupon the rule and regulation would cease to be what the words imply, and would become in itself a legislative act. All therefore, that Congress contemplated in the passage of the Philippine Government act was that within the limits of the powers reputed to the Philippine Government it should facilitate the carrying out of the congressional intent, not that it should amend or change Congressional provisions. Its acts can only be considered as a ratification of such rules and regulations as were what the terms implied, and not such as imposed or created new conditions and new circumstances at variance with the act of Congress. Congress did not say that the provisions of this act, with relation to public lands, should be changed or added to, and that such change or addition should be legal as soon as it is assented expressly or tacitly, yet it can only be by taking such a view of the matter that the Philippine Commission could undertake to legalize the sale of more land to an individual than congress contemplated, or the sale to class of individuals whom congress had never authorized to receive title. It seems of the highest importance to call attention to certain rules of the common law, and one or two embodiments of the rule in statutory law, which seem to offer a touchstone to determine whether the actions of Government officials in the Philippines in the case to be enumerated were consistent or inconsistent with the principles of sound business morality. It is a principle of law so well known as to need citation, save it were to convince persons as ignorant of fundamentals as seem to have been the leading officials of the United States in the Philippine Islands, that a person occupying a trust relation can not deal in the property with relation to which he is a trustee, and can gain no profit out of or from such dealings if he so far transgress as to deal in it. having, therefore, laid down the general principles, which in our judgment, control, or should control, the disposition of lands in the Philippines to public functionaries, let us consider the actions of Philippine officials with regards to Baguio lands, beginning with those who are the highest in office. The present Governor General of the Philippine Islands is W. Cameron Forbes, who became such governor in the year 1909, having been appointed Vice Governor on July 1, 1908, previous to which time he was Secretary of commerce and Police. Governor Forbes purchased at Baguio, on may 28, 1906, two tracts of land aggregating 64,600.03 square meters, or, nearly as may be, 15 acres of ground, For this he paid 1,293 pesos, or approximately 86 pesos per acre; in gold about $43.00. It is a fair assumption from the evidence that this was the appraised value, and this assumption is borne out by the testimony of Secretary Worcester. The appraised value was fixed by an Assessment committee, whose actions were subject to the approval of Mr. Worcester. To the extent therefore of 15 acres of land, in what was designed to be the summer capital of the Philippines, Mr. Forbes became the purchaser of a tract of land which, according to Secretary Worcester he, Forbes, considers the best site in Baguio. No thought of the impropriety of his conduct seems to have entered the head of the Governor General of the Philippine Islands. For many years, in fact, nearly or quite from the beginning, Dean C. Worcester has been Secretary of the Interior of the Philippine Islands. The land laws, with all their incongruities, with their defiance in spirit and in text of the statute of the United States forming the Philippine Government have been framed or supervised by him. Mr. Worcester controlled the Board making the appraisements upon the land at Baguio. He knew in advance of the establishment of the new town, the tract he desired for himself. As he says, "It was known for fully five years that I intended to bid for the lot, which I afterwards occupied." His appraisers, therefore, whose actions he confirmed must have known the same thing. he, like Mr. Forbes, considered that he has the best site. he purchased, on May 28, 1906, the date of the purchase of Mr. Forbes 39,676.97 square meters of land, paying therefore 595.15 pesos. In other words, for approximately 10 acres, he paid 60 pesos per acre, or $30 in gold, in the summer capital of the Philippines, upon the approach to which hundreds of thousands of dollars had been expended, and hundreds of thousands of dollars, as stated, had or have been since then, paid out for public buildings and public improvements under the direction of the Philippine Commission, consisting of himself and his immediate official and personal associates. As if this were not sufficient defiance of all rules of official propriety, on the same day that the personal purchase was made by Mr. Worcester, there was sold to the Baguio Country Club, of which Mr. Worcester is President, 345,473.97 square meters, for the sum of 2,303.20 pesos, being approximately 82 acres at the rate of 28 pesos per acre, or in gold, $14. There existed an estate, at its nearest point 8 miles from the boundaries of Manila, having upon parts of it over a thousand people, and adjoining another estate lying between it and manila, upon which there were over two thousand. This estate, called Tala, was for the most part unoccupied, and Mr. Frank Carpenter, Executive Secretary, determined to acquire such portion. The conditions or terms of payment deserve special attention. The average price per acre was 7.48 pesos, which would make the whole tract 31,677.00 pesos, this to be paid at the rate of 1% per annum for 20 years, a credit being allowed carpenter for the amount he may have paid under his leases. The average per acre per year, therefore, to be paid on account of the purchase price approximates 37-1/2 centavos (18-1/4 cents) per acre plus 4% interest on the deferred purchase money. The net result, therefore, of this proceeding is that Mr. Carpenter at the end of 20 years will find himself in the possession of property originally valued at about P32,000.00, paid for by the labor of his Filipino tenants, increased in value by the expenditures of the public money, literally promised and liberally made by the government of the islands, and, so far as he is concerned, he will have furthered the creation of a landlord and tenant system in the Philippine islands, turning the Filipino from being a possible landowner into that of a contributor to the wealth of an alien race. All this is done under the guise of tender consideration for the welfare of the Filipinos. Captain Sleeper, Director of Public lands, confined his operations to investments in mining prospects or mines. In this respect, he would, in the United States fallen under the condemnation of the statutes. In the Philippines, his actions escaped statutory condemnation, and received the praise of his superiors in office. J.R. Wilson, Assistant Director of Public lands, applied to lease nearly twenty-five hundred acres of land in the Island of Mindanao for 25 years, renewable for a similar period. This application, while not formally granted, had never been rejected at the time of the inquiry. For this he apparently was to pay 50 centavos per hectare. The worthy example set by Government chiefs was not lost upon their immediate subordinates, and the virus extended all through the service. We will cite only a few illustrations. Mr. Z.K.Miller, machinery expert of the Bureau of Agriculture, applied for 350 acres of land. Solicitor General George Harvey, paid 10,000 pesos a year by the Filipinos, appears as the president of the Siasi Plantation and Building Company, applying for a lease of 2,500 of land. A very large number of employees appear as purchasers of tracts of Baguio. Mr. E.L.Worcester, nephew of the Philippine Secretary of the Interior, seeking new bulbs wherewith to glorify Easter, went to the islands. In the rich lands of the province of Nueva Ecija he discovered a tract of nearly 2,500 acres so level that by making little embankments the water in the rainy season could be retained long enough to produce rice. For this land he applied, and with no difficulty the Government leased it to him at the lowest rental allowed by a law apparently framed by the Secretary of the Interior. it would be useless and unnecessary to multiply indefinitely as we might instances of dispositions of public lands to private individuals or corporations, in violation of the letter and spirit of the law, but we can not refrain from giving some special attention to those to California corporations. Certain peculiarly well-informed sugar interests in this country, evidently in a position to read the future with marvelous accuracy, determined, far in advance of congressional action as to admission of sugar from the islands, to invest largely in Philippine lands aside from the purchase of Friar lands hereafter to be discussed, and these interests thought it advisable to purchase public lands. Though Congress had, as we have stated, limited possible sales to Filipino citizens and corporations, the Commission, with lofty disregards of a legislative body 11,000 miles away, had made a law unto itself permitting sales to American corporations, and thus it came to pass when the San Mateo Agricultural Company, the San Carlos Agricultural Company and the San Francisco Agricultural Company, all California corporations, presented themselves through E.L. Poole, the common agent of the american sugar interests, he was heartily welcomed, taken on a Government steamer to Mindoro, shown the fatness of the land and given patents for his principals. Thus, it was that 7,500 acres of Philippine public lands, their heritage as the Filipinos vainly fought, passed into the possession of a small group of Americans who will give Filipinos leave to toil for aliens on the lands of their fathers. This land, capable of supporting as Filipino farms go near 2,000 people, is made the patrimony of a few persons, foreign to the workers. It is probable that wrongdoers are rarely unable to justify to themselves their own wrongdoings. In this instance we find that the sale or lease of Filipino land in great quantities to exploiters is justified under plea of the highest welfare of the Filipino, their more steady employment, their enhanced wages. Even so did Jacob undoubtedly justify his purchase from Esau of his birthright for a mess of pottage, for by so doing did he not give Esau a new lease of life? Has not many a moral slave dealer justified the reduction of his captive to submission by pointing out that but for his intervention the slave would not have been taught the ways of industry and shown the truths of his owner's religion? It is not a far cry from the position of Jacob or of the slave dealer to that of Secretary Worcester and his fellows of the Philippine Commission. let us review some of the facts and see. Ostensibly to benefit the Filipino, to give him employment and raise his wages, the Commission, as we believe we have shown, violated the law in the sale to sugar magnates of 55,000 acres of Friar lands. The purchasers intend, first, to establish a sugar mill of large capacity and grind all the cane to be produced on this tract and other tracts of 7,500 additional acres. Next, they seek to put to work, for a while at least, as many Filipinos as will work for them. They they propose to sell off or lease to these or other Filipinos the lands they work, and grind their cane for them. After the Filipinos shall have bought or leased in small farms, and at such prices as the syndicate may fix, the lands in question, the mill will grind their cane, and will be able to charge for such service a price which will leave the Filipino his bare subsistence. The poor Filipino will be at its mercy, for there will be no competitor for the purchase of the cane. A perfect working illustration of the operations of the modern "trust" will thus be supplied, and a thousand Filipinos will make "bricks without straws" for strange masters. The plan is well thought out, and save for unexpected obstacles, not to originate from the Commission, will meet with success. That success is to be expected will be apparent from a consideration of the circumstances. In the island of Negros are Filipino farmers making a fair and independent living, though only with their crude mills extracting 50 to 60 percent of the saccharine matter. These can not compete with farmers in Mindoro from whose cane will be extracted 90 to 95%. They must either immediately retrogress in he social scale or move to Mindoro. Accepting the latter alternative they become first laborers for the sugar syndicate and next land owners or lessees in a small way, surrendering all their earnings, save a bare pittance, to the Mindoro Development Company. Their birthright will have been sold today for a mess of pottage, and tomorrow they will go hungry. Let us conceive what an opportunity the Commission in its blindness has thrown away. If, instead of spending the money of the people in Baguio, improving the property of its members, building a mansion for the Governor general and in other things burdensome to the people, it had started or helped start sugar mills in Negros or Cebu or Southern Luzon where charges for grinding would have been under the control of the Government, real prosperity and independence would have been the lot of the Filipino farmers and a debt of gratitude would at least have been earned. As it is, the Filipino has seen his patrimony frittered away, as far as opportunity to fritter it away has opened to the Commission. land capable of supporting in comfort and plenty many thousand of toilers has become the possession of the few. The Old World conditions, which have caused millions of people to cross the Atlantic to the United States, are, so far as the humble powers of the commission permit, being reproduced in the Philippines. The ornithologist of Michigan has become a land owner, virtually through sale to himself, the seeker after Easter lilies is the lord of thousands of acres, the executive secretary has ans will have hundreds and even thousands of Filipinos contributing their toil to swell his fortune, the debonair gentlemen of the future American-Philippine sugar trust will command the services of thousands of tenants, the rich sugar lands of the Isabella tract will make more Americans millionaires. Except as we have indicated we do not attack the "law" honesty of the Philippine officials. While they may not have stolen the goose from off the common they have permitted the theft of "the common from off the goose." Their intelligent comprehension of their duty to their wards we deny in toto. They have no more idea of true republicanism, of true democracy, than if they had lived 300 years ago. Modern thought means nothing to them. Conservation of resources for future generations they are incapable of understanding. it is not necessary for us to determine how far their errors and blunders and shortcomings are due to the situation in which they find themselves. We can not forget however, that they have been petty monarchs among a people for whom their contempt has been little disguised. Filipino public opinion is either ignored or its existence denied, as has been done before this Committee. Their attitude is that of the aristocrat toward the plebe, the master toward the serf. Too ignorant to know they should not speculate in things as to which they were trustees, they have had the effrontery to judge as to what was good for a people over whom an unkind Province has placed them. We have finished our review, incomplete as of necessity it must be, but developing the most salient points. What should be done? Many of the most prominent American officials in the Philippine Islands have demonstrated such intellectual unfitness and moral obtuseness that they should summarily be removed. The Philippine Government, without authority, has caused deeds and leases of public and Friar lands to be executed to American citizens and corporations. The Attorney general should be empowered to take appropriate methods to have these instruments set aside. it should be made a criminal offense for Philippine officials directly or indirectly to purchase or lease the lands of the Philippines. Such further legislation should be had as will absolutely prevent american exploitation of the Philippines so long as we exercise jurisdiction over them. While we have enumerated those things which seem most immediately pressing, we should not for an instant be unconscious of the infinite egotism of Americans in assuming that they, who as yet are but learning to govern themselves, are competent to rule a people of another language, customs, traditions, ideas and mode of thought. Rather than continue to display our necessary incompetence, we should permit the Filipinos in their own way, learning by their own mistakes to develop for themselves that system of government and that civilization which will prove most nearly in accord with their aspirations. The Jackson H. Ralston Prize and Lectureship in International Law was established in 1973 at Stanford University by Mrs. Opal Ralston. The Prize is dedicated to the memory of Mrs. Ralston's husband, a distinguished practitioner, judge, teacher, and scholar of international law. The Prize is awarded to an "original contribution by a man or woman to the development of the role of law in international relations." It defines the concept of law to include broadly "all human efforts to regulate man's activities towards the establishment of international peace and justice, including activity in arbitration, diplomacy, international organization, and other steps toward the peaceful settlement and establishment of the conditions and promotion of world order." Recipients of the Ralston Prize are chosen by a Stanford Law School advisory committee, which submits its choice to the Dean of Stanford Law School, the President of Stanford University, the Chief Justice of the California Supreme Court, and the Secretary General of the United Nations for approval. The Stanford Journal of International Law publishes the Ralston Prize Lecture given by the recipient of the award. Previous recipients have included Elliott Trudeau, Prime Minister of Canada (1990); Oscar Arias Sanchez, Nobel Peace Prize laureate and President of Costa Rica (1988), Jimmy Carter, President of the United States (1987); Tommy Koh, Singapore's Ambassador to the United States and the United Nations (1985), and Olaf Palme, the late Prime Minister of Sweden (1977). NOTE: The Crucible Of Empire - The relatively short Spanish-American War was the door to American Imperialism. It may seem remote but please read the below Concluding Observations regarding a major and disastrous impact of Parity Rights on our national patrimony,including our lands now owned, leased and/or controlled by foreigners. These mostly unknown facts comprise one root of the existing generational poverty among our fellow native Filipinos. I see I misspelled Philippines, but as the result of the crash course I received from just reading some of The Untold Story - Kingdom of Maharlikhans, I just don't know. Is, or should, the country itself be referred to as Maharlikha? This whole thing with Spain and the friars and monks, and so forth is just incredible. However, if you read anything about the Jesuits (Jack Chick/Chick publications), the vatican, and Inigo Lopez de Recalde (Ignatius), then it does make sense. We see that Rome has been everywhere.